A lien claimant's lien rights or notice of lien may be released upon the posting of a surety bond in the manner provided in NRS 108.2415 to 108.2425, inclusive. 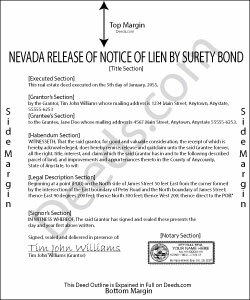 The Release of Notice of Lien by Surety Bond is used to obtain the release of a lien for which a Notice of Lien has already been recorded against the property. In order to obtain a lien release, the principal and a surety must execute a surety bond in an amount equal to 1.5 times the lienable amount in the notice of lien. Once the Release has been recorded, the lien claimant has 10 days to cause the lien to be released or discharged by filing a Discharge of Lien. After you obtain the surety bond, you may file a petition with the District Court requesting the release of the lien pursuant to the bond. Contact an attorney with questions about using surety bonds to release mechanic's liens.